2.6.3 The teacher emphasizes critical-thinking and problem-solving tactics and strategies by using higher-order questions (e.g., those that deal with similarities, differences, efficiency and effectiveness). Tips And Tools: The Art of Experiential Group Facilitation. Stanchfield, J. (2008). 3 Most Common Misunderstandings: List the three most common misunderstandings of a given topic based on an audience of your peers. 3 Questions: Ask three questions about the topic, then rank them in terms of their importance/value. 5 Whys: After a response is given, ask the student(s) "why?" Repeat the process with subsequent answers, up to 5 times. Beach Ball: Write questions on a beach ball. Throw the ball to whoever wants it. ​The person who catches the ball answers whichever question is closest to them. Chat Stations: Stations with discussion prompts that students visit in small groups. Corners: Each classroom corner represents a different answer or opinions for each question. When the teacher asks a question, each student goes to the corner that best represents his or her answer. Based on classroom discussion, students can move from corner to corner to adjust their answer or opinion. Dos and Don’ts: List 3 "Dos" and 3 "Don’ts" when using, applying, or relating to the content. Exit Slip: Question they must answer to leave class. Jigsaw: Each student from each group picks the question from a list that they want to answer; they find other students that picked the same question. discuss. and come to consensus; and then bring the answer back to the original group to share. Think-Pair-Share: Students think about the question, share their response with another student, and then possibly share with the class. See these alternatives to think-pair-share and this article for more information. Walk and Talk: Pair or group up students and have them go on a walk while they discuss the provided questions. Yes/No Chart: List what you do and don’t understand about a given topic. Establish rules for responding to questions. Ensure that no student(s) dominate the discussion. Ask open ended questions and avoid yes or no questions. 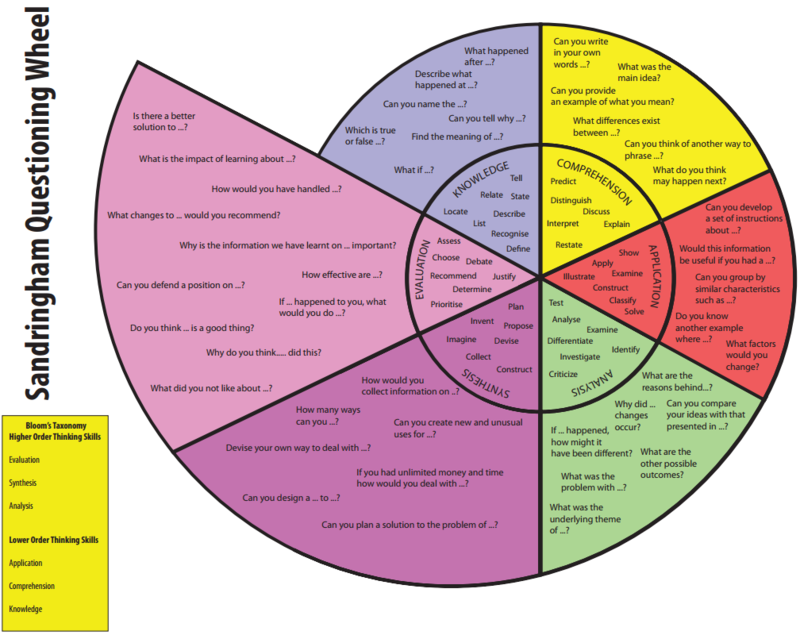 Ask questions from different levels of the cognitive taxonomy. Provide visual aids for the questions if needed. Allow students to answer as a group. Provide encouragement and use multiple verbal responses for recognizing good answers. Let students build on each others' answers. Repeat answers back to the student to ensure a mutual understanding. When needed, ask students to elaborate or clarify their answer. Clarify incorrect answers without embarrassing the student. Acknowledge that we all make mistakes and that is part of the learning process. ​​Ensure you provide enough wait time to process the question. Calling on the first student that raises their hand stops the learning process for other students who are still thinking. Do not call on unprepared students as a form of punishment. It is important that students feel heard from their peers and teachers. Use the following guidelines to improve active listening skills and Test Your Active Listening Skills Here. Pay Attention: Look at the speaker directly; Listen to the message without forming a rebuttal; Avoid environmental distractions; “Listen” to the speaker’s body language. Show that you are Listening: Give non-verbal messages that your are listening; Ensure your posture is open and inviting; Encourage the speaker to continue using small verbal comments. ​Provide Feedback: Reflect what has been said by paraphrasing; Ask questions to clarify certain points; Periodically summarize the speaker’s comments. ​Defer Judgment & Respond Appropriately: Allow the speaker to finish; Don’t interrupt with counterarguments; Be honest and respectful in your response. Is the question asking more than one thing? Do participants have the necessary information to answer the question? Is the question specific enough? Is the question loaded or biased? Will respondents answer the question truthfully? Is a time frame specified? ​Dialogue Defibrillators: Jump-Start Classroom Discussions! ​Debriefing is an important part of team building activities and allows students to process and reflect on their experience. The learning that occurs in these activities have "real world" applications and a quality debrief is one way to make that connection. The debrief should be facilitated by the instructor, with students taking control of their learning and leading the discussions. The strategies listed on this page are also useful in regular discussions and lesson closures. ​Students describe the events that transpired during the activity. How did you feel or think when …? How are you feeling about it now? Who else had that experience? Who didn't? ​Students explain what they feel they learned from the experience. What was the main point of the activity? How did you work with your team? When were you really effective or at your best? ​Students explain how they can apply what they learned from the activity in different situations. Have you experienced this type of situation before? If so, when? How does this relate to outside the classroom? How will you use what you learned in this activity? Planning: What was the most important feature in planning? Communication: How did you know that what you communicated was understood by the group? Leading and Following: Who assumed leadership roles during the activity? What did they do that caused you to think of them as leaders? Making Group Decisions: How satisfied are you with the decisions that were reached by your group? Real World Applications: How would you use this in your life outside of class? Team Interaction: Can you provide specific examples of when the group cooperated in completing the activity? Conflict: How similar or different were the opinions in your group? Differences: How did commonalities or differences between group members help in completing the task? How did they create difficulties? Trusting the Group: Can you provide examples of when you trusted someone in the group? Choose a specific goal for the activity and focus questions on that goal. Take notes and record what you hear during the activity. Use “stop actions” in the midst of a challenge for groups to stop, look around, and identify what is working or what is not working. Go over ground rules with the students on how to debrief (either facilitator or student led). Everyone sits in a circle, including the facilitator (teacher). If possible, use the same location for your debriefs. Give students plenty of time to think about the question. Have students write down their responses prior to speaking to help them collect their thoughts and reduce anxiety about speaking. Everyone is allowed to say no or pass; it is okay to just listen. Be aware of others in the circle and acknowledge them when it's their turn to speak or are being distracting to the class. Encourage those who are not participating to speak by asking them inclusionary questions. Keep the students connected during the debrief by leaving equipment around that was used in the activity. Present an open ended statement that students can complete. Pick key words that the students have used and when they have finished their response simply say the word in an inquisitive manner (i.e. "Respect?" or "Pressure?"). At the end of a session, summarize what was said and learned throughout the debrief. What is spoken in the group stays in the group. One person speaks at a time without interruptions. Put downs are not permitted. Ask for clarifications if you are unsure of someone's response. Piggyback off of each others’ ideas. Be encouraging and disagree constructively. Speak only for yourself using “I..." statements. Provide resources to help your students. Chiji/Expression Cards: Students choose a card that best represents an experience, feeling, thought, or emotion that they had during the activity. Complete the Sentence: Give students a partial sentence to complete. ​For example, "During the activity I felt..."
Crumpled Paper: Students write anything they want about the activity, themselves, or the group and throws it into the center circle. After mixing up the crumpled papers, everyone takes a piece of paper and reads it aloud to the group. Faces/Emojis: ​Pass around laminated sheets and each student will choose one picture that represents how they currently feel or how they felt during the activity. Index Cards: Write debriefing questions on index cards and pass them out. ​Have the participants reflect and answer the question as part of whole group, in partners, in small groups, or by themselves. One Word: Students use one word to characterize how the group conducted itself. ​Quick Toss: Toss an object around the circle and when caught, participants answer a predetermined question or can share a thought, compliment, or experience. Rocks: Pass around a bag of rocks and tell students to take as many as they want from the bag (at least one). ​For each rock they took they will explain one thing about the activity to the group. Rose, Bud, and Thorn: Each person shares their rose, bud, & thorn. ​Rose is something they enjoyed about the activity, thorn is an area that needed improvement, and bud is something they took away from the activity. Skill Lists or "Top x": Students brainstorm a list of skills they use in an activity and write them down. Snapshot: Students are asked: "If you were to take a picture at any moment during the activity, what would have taken a picture of and how is it representative of your experience?" Thumbs Up, Down, or to the Side: ​Rate how the group (or you) did, and explain why you rated it that way. Traffic Lights: ​​Each student chooses either the red, yellow, or green light to represent what they thought about the activity and then explains why. ​Green light = full speed ahead, yellow = proceed with caution, red = stop! Web of Compliments: ​The group passes an object to each member. ​When they receive the object, that person must pick a person, say why they are proud of them, and then pass them the object. What Part are You? : Ask each person to choose the part of the activity that best represents their role within the group. ​For example, what part of the house best described your role in the last activity and why? Yard Stick or Ruler: ​Each student shows how they rated the activity by touching a number on the ruler and sharing why they touched that number.